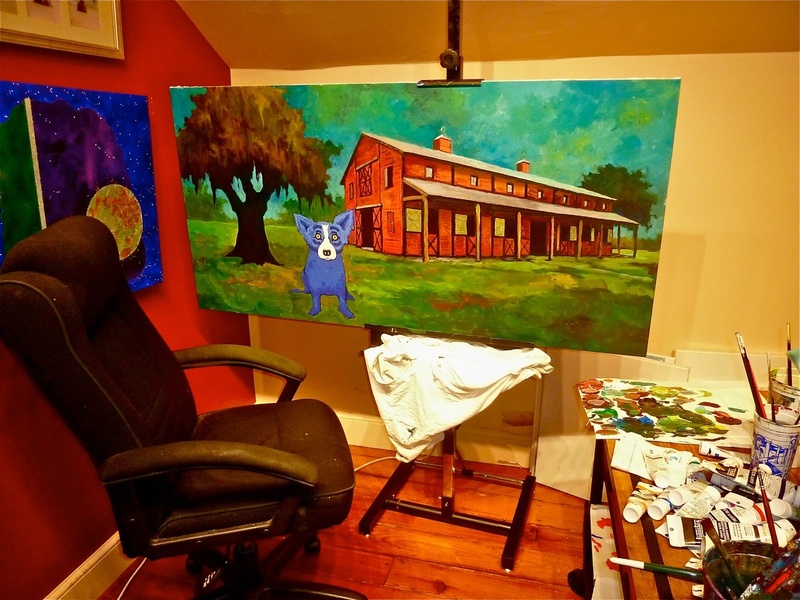 George Rodrigue and I returned to New Orleans early August as though our old lives were a dream. It’s hard to believe we threw parties in this house, I mused, as we settled into our sofa and BBC television. “I barely remember going out to dinner,” countered George. Meanwhile, artist Glenda Banta asked me on-line about our home, about sharing snippets of collections and décor (Ha!) within my blog and on facebook. 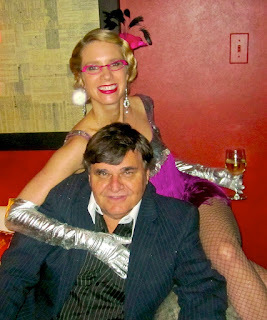 I dreamed, or rather nightmared, as I thought about it, recalling New Orleans designer Nadine Blake in our Creole townhouse last May for a friend's birthday party the night before we left for three days, which became three months, in Houston. With southern grace she complimented our living room, yet I recall with horror her talented eye scanning our eclectic mess. I also remember that night as the last time I wore a dress, heels, or make-up, the last time I small-talked, the last time I sipped champagne. George and I have no use for decorators, and I mean that without offense to their profession, but nevertheless literally. If we hired one, it would become full-time work, sort of like our contractor on the payroll for twenty years, currently repairing our roof and garage. The decorator could live in the guestroom, I suppose, on call for shifts between museum exhibitions, as artwork disappears and materializes, sometimes one piece, but more often ten or twenty, on loan for a month, maybe a year, leaving us, as was the case upon our return a few weeks ago, with blank walls and empty nails. To compound matters, we dissembled my office adjacent to our bedroom, creating a temporary studio for George, who sits at his easel for the first time since February after months of back and shoulder pain. This return is in his own time, now every day, some for thirty minutes, some for hours, as he heals slowly, at last nourishing his psyche as well as his body. A decorator in our home faces not only the hodge-podge of our legacy, my parents' Asian and European furniture, everything from Thailand to Bavaria, and George’s New Iberia treasures, including his boyhood rocker and his father’s brick-laying tools, but also our disconnected taste in art, everything from 17th century South America to 20th century New York, from the novice potter at the craft fair to Warhol’s John Wayne. 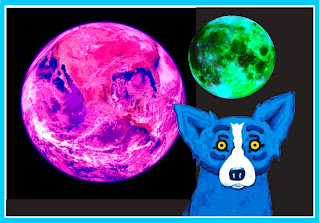 Mix in Rodrigue, his student works, his Oaks and Cajuns, his Nudes, his Photography, his Sculpture, and, commanding it all with its presence, his Blue Dog, and you realize our self-induced and, admittedly, enviable challenge. Although I took photos, I post in this blog, after much reflection, only a few. Tempted to share more, I'm guarded in this privacy, despite the personal vignettes within my writing. Several years ago, we ceased opening our home to fundraisers and strangers. Even with photographs, to do so now feels exposed to the point of no return, like, your consolation, admitting to the Shaun Cassidy poster taped for years to the back of my bedroom door. 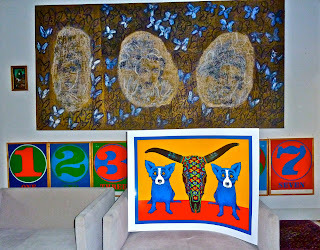 It so happens that today we hang a new piece of artwork, a 7-foot painting by Mallory Page, an abstract from her series “Tree House” (pictured below, on left), eventually headed to George’s studio in Carmel, but today filling the spot in New Orleans left by his Indians, Cajuns and Cowboys, currently on loan to the Amarillo Museum of Art. The purchase was not without adventure. We planned to buy a Page last spring, but George’s health distracted us. Still on his mind, he sent me to her gallery immediately upon our New Orleans return, choosing a painting before the frenzy of White Linen Night. For the first time since May, I donned a dress and heels. I tried eye make-up but felt clownish, settling for a lip pencil and a bit of gloss. Wearing a Jergens tan and dull-rooted hair, its only attribute that it now reaches mid-back, I drove, also for the first time since May, venturing towards the Arts District and a life that seems like it now belongs to someone else. Self-conscious in my world and attune to the vulnerability in her abstracts, I chose quickly and easily at Page’s gallery, rushing back the two blocks to my car. In the street, my 2007 Louboutin wedges caught a NOLA pothole, and as my ankle twisted, my flouncy dress flew to my waist. I sat on the hot asphalt shedding hot tears until a man, a male Jerusha Bailey,* offered me a hand. “You shore have nice legs," he said. I watched him walk on, whispered thank you too late, and absorbed the first compliment I’d heard in months. And I wondered without worrying if, like George’s mother, we now live, for better or worse, a bit lost in the past. Every once in a while a new silkscreen provokes a collective gasp--- from our staff, from collectors, even from George Rodrigue himself, as though surprised by his own artwork. It first happened in 1991 with Starry, Starry Eyes, then in 1995 with Party Animal (a Mardi Gras tribute), and again in 2002 with over-sized motorcycle images called The Rat Pack, all original prints (not based on paintings) that caused a telephone-frenzy and sold out within weeks of release. 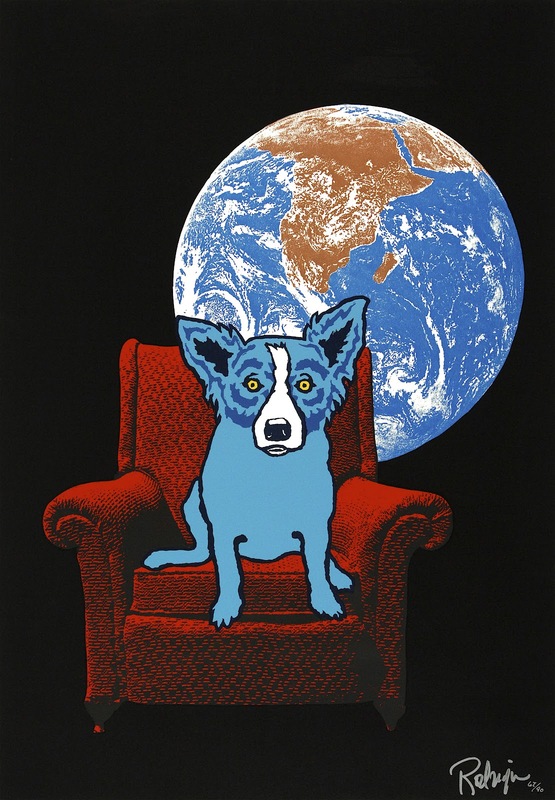 This month we see it happening once more, with the stunning new silkscreen, Cow Dogs. 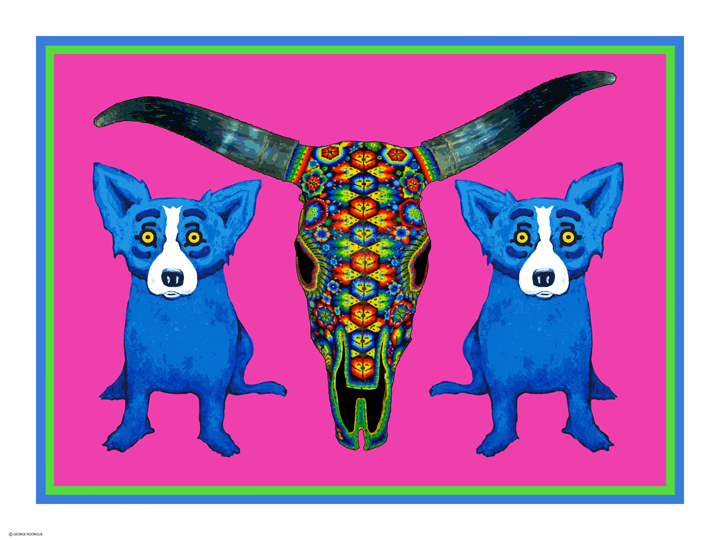 Rodrigue’s love of color, strong symmetrical design and iconography combine in an effective, even perfect, result. I asked him about the symbolism, recalling Picasso’s Bulls and O’Keeffe’s Skulls. “It seems like every artist throughout time interprets the heads or skulls of horses and cows. The early cave drawings at Lascaux were renderings of some kind of four-legged animals with horns. It’s a traditional fascination within art, inspiring creative interpretations, connecting man with animal. “In the end, each artist puts his own indelible mark on basically the same subject matter. It was in 1993 that Rodrigue first incorporated these skulls into his designs, creating Moo-Cow Blues and Pueblo Puppies (click titles for images and related posts). Like Cow Dogs, these artworks are symmetrically strong. 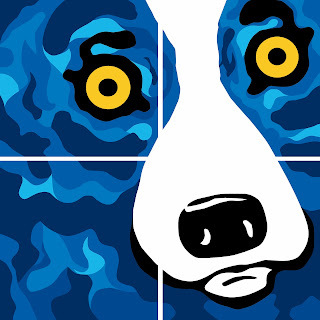 Yet they are prior to advancements in silkscreen colors and complexity, changes related to not only Rodrigue’s artistic growth within this medium, but also the progress of technology. Although not his primary intention in this artwork, Rodrigue’s Cow Dogs suggest his lifelong fondness for Texas and the American West. 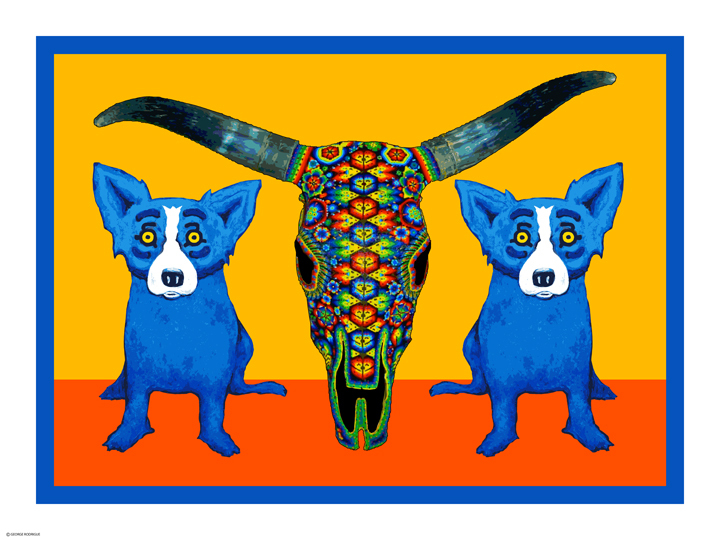 Coincidentally, Blue Dogs in Texas opened recently at the Amarillo Museum of Art (through October 14, 2012). The exhibition features more than 100 paintings by George Rodrigue, such as the classic artworks pictured below: The Immaculate Dog, Kiss Me, I’m Cajun, Paint Me Back Into Your Life, Wendy and Me, and a painted fiberglass cow, one of three within the exhibition, including the original version from the Chicago Cow Parade, painted by Rodrigue for Neiman Marcus, Michigan Avenue, in 1999 (detailed here; click title-links above for more on these paintings). “Most of my museum exhibitions are retrospectives, because I want the audience to see how I painted forty years ago and how my artwork has progressed to the present. 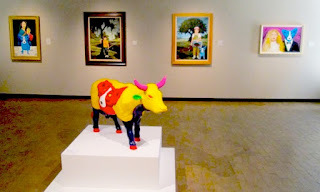 “I think folks will be surprised at my ‘Louisiana Cowboys.’ It’s a subject I’ve approached many times over the years, and we’ve included a large selection of these paintings in this exhibition. I hope people like them as much as I’ve enjoyed returning to this strong American theme in both my Cajun and Blue Dog paintings. 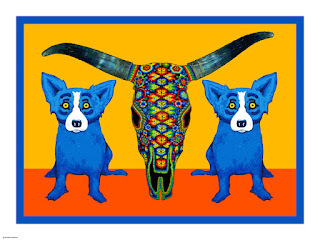 Although aware of the Amarillo exhibition, Rodrigue began his work on Cow Dogs long before Blue Dogs in Texas, playing for nearly a year with the design. The timing is coincidental, and this particular print (unlike the recent Big Texan Sky) is less a Texas tribute than an art historical reference. 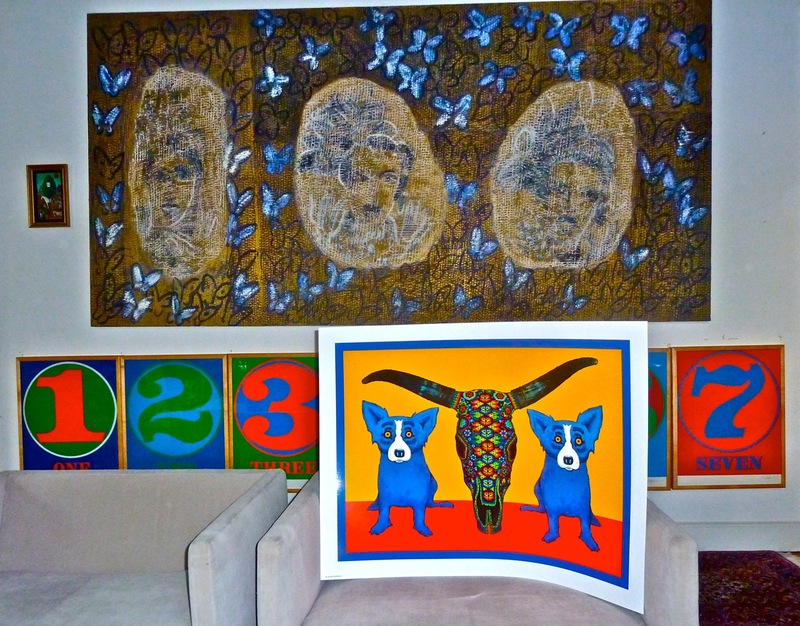 As I write this, I stare at Cow Dogs propped within our living room, where it seems at home with Hunt Slonem’s Carmen Mirandas and Robert Indiana’s Numbers, all strong, repetitive, classic imagery. It was the painting Loup-garou of 1991 that altered the Blue Dog concept for George Rodrigue, as he abandoned his oak trees and Cajun figures for the first time since the late 1960s. Although he painted the Blue Dog initially seven years before, the early works incorporated his new subject into Louisiana backgrounds so that the dog appeared as a Cajun person, trapped within the symbols associated with both Rodrigue and his home state. In Loup-garou he leapt, painting the Blue Dog on its own, six feet tall and abstract (pictured here). The commanding imagery transcends both the Cajun-French myth and the animal known as ‘dog,’ becoming something else, vague yet powerful. Rodrigue recognized immediately that the painting was his, even without his typical oaks and Cajuns. This leap occurred as much within George’s mind as it did on his canvas. It was in his silkscreens that Rodrigue took his greatest risk, abandoning not only the oak tree, but also brushstroke and blending, in favor of simplicity and clean lines. 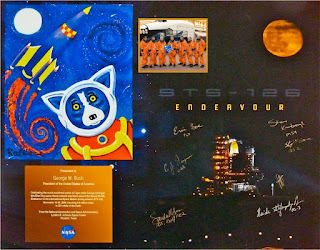 Later, he not only painted the dog with planets and in space, he envisioned it in space, as a work of art, traveling beyond Earth’s atmosphere, a project realized when the crew of Space Shuttle Endeavour carried his artwork Life’s a Blast onto their last mission, the painting altered in size and materials so that it safely adhered to the inner wall of the shuttle. Upon their return, the Endeavour astronauts presented the collage above to President George W. Bush. Despite his space and spatial exploration, Rodrigue never truly abandoned the oak tree or the Cajuns. 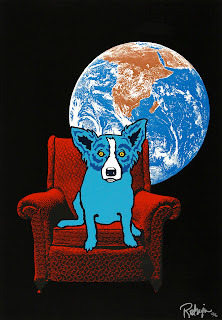 Following his initial burst of freedom, he incorporated his Evangelines and Jolie Blondes into his Blue Dog works. For Rodrigue, despite humorous titles and outward perceptions, this was serious, as he approached on his canvas concepts of shape, design and color. It’s no wonder that this summer, while trapped for weeks within a small Houston, Texas hotel room with nothing but his imagination and his computer, the universe and outer space lured him again. He worked at his computer, vacillating between simple and complex, transposing his world from a narrow reality to endless possibilities, from his brain to his screen and, this month, from his screen to a chrome surface and the gallery wall. 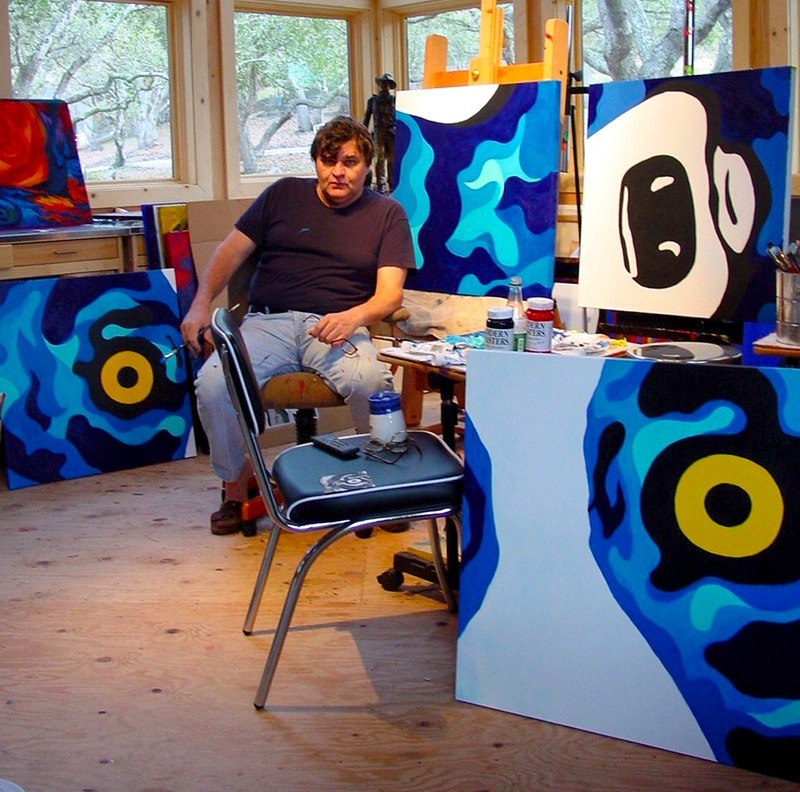 Researching his inspiration, I asked George Rodrigue about this fascination with space. He recalled his childhood, midnights on the roof of his New Iberia home, staring at the stars through his first purchase, a telescope, paid for from sales to high school classmates of hand-painted monsters on t-shirts. But more, he discussed the concept of art itself and the personal focus that grounds him in reality even as he soars within his mind. -above, a 2012 video clip from PBS’s "Made in New Orleans"
After ten weeks in Houston, George Rodrigue and I returned today to New Orleans for a bittersweet homecoming, as we change our undesired summer’s routine, while leaving behind the people who shared our experience, the people we grew to love. It’s weird, I said to George a few weeks into our summer, it’s not like we’re in Houston; it’s like we’re on some medical planet. We saw some of them weekly, some daily. We held in common personal struggles, each unique and similar at the same time, folks from around the world, some fighting for their lives, some saving lives, but all grounded, as we practiced together the rawness and realness of life outside of the expectations and obligations of normality. For George and me, this was an oddly welcome diversion from society, from fundraisers and dinner parties, from lectures and book signings, from the curiosity and gossip that accompany his fame. 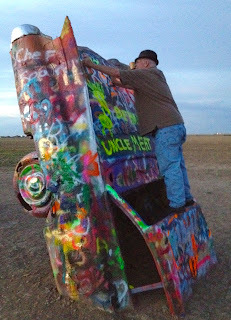 Still, George gave impromptu art lessons this summer in the most unlikely of places. Too weak to paint, he embraced these discussions, sharing not because he felt obligated, but because he sincerely misses painting, and because his new friends relate less to the celebrity and more to the man. “Every great artist has taken a common thing and made people see it in a different way,” he explained earlier this week. There are people, we all know them, who live life on the surface. Maybe pretense is easier; maybe it follows from childhood defenses or a sense of self-preservation. Some seek the cliché and “find themselves,” while others drift happily in a contrived and, perhaps safer, existence. This summer, George Rodrigue and I experienced for the first time in our lives a Reality Planet (as opposed to Reality TV! ), a place immersed in raw emotions, genuine concern, unabated fear, and tenacious courage. I’ve never seen him turn down strawberries and cream, I whispered, distressed, to one new friend. She nodded and smiled, because she knew. ....and her empathy, a welcome epidemic on this Reality Planet, comforted me. 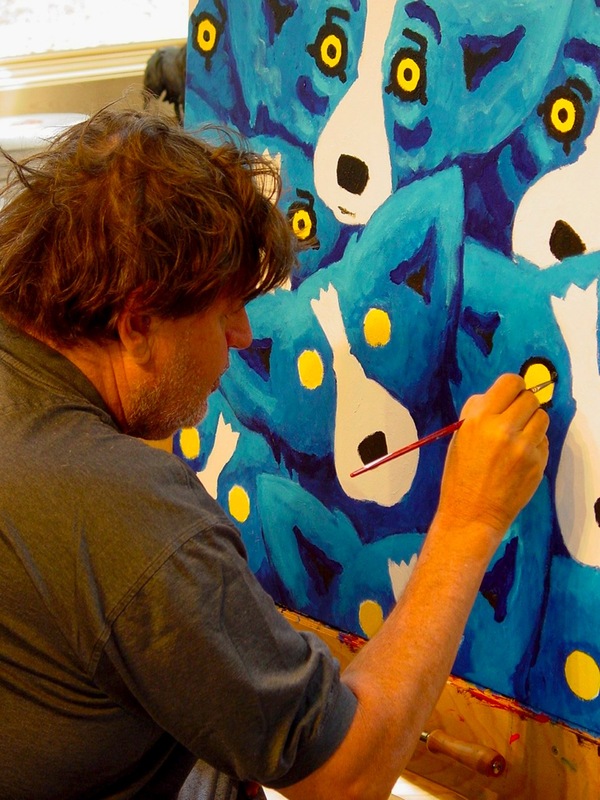 Today, I can say with certainty that a healthy and strong George Rodrigue will return soon to his easel. His ordeal began more than twenty years ago, when paint fumes and varnishes poisoned his body, and it culminated this summer with a near collapse of his spine followed by ten weeks of treatment. ...he asked his doctor, who warned him of the flu-like side effects of one medication. The doctor looked at me, confused. He doesn’t know the flu, I explained. He only knows big stuff, like polio and the plague. 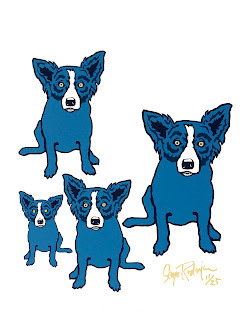 George Rodrigue is stalwart in the face of difficult situations, and from the beginning I believed (because I had to) that, one way or another, he would beat his illness. “A lot of stuff, good and bad, happens to me; but I don’t let any of it get attached to me. Once I make myself happy, that’s the end of it. 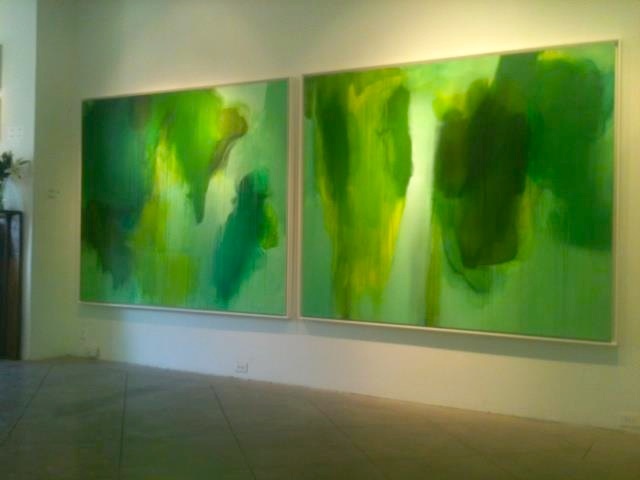 I paint a painting; I’m happy; and that’s me.” -G.R. Both of us, as this summer ends, struggle with the good news far more than the bad. We are trapped within our guilt, and many nights George cries, “Why me?,” as we think of our new friends. We couldn’t bring ourselves to tell them while in Houston of a rare mutation, discovered just last week within his disease, treatable with a simple pill, and guaranteeing his recovery. Folks talk of grace, karma, luck, fate, what have you – but none of this explains our situation; because George Rodrigue, the oldest in the room, will recover, while these young folks with young families still fight and fight and fight. We are home for a short time, and we are changed. How exactly remains to be seen. But something happened…..something BIG.